When Keriann put an ad on Craigslist, she was just looking for a roommate to help pay the rent. She didn’t get one. Instead, she found a husband, a partner, and a new life full of sunshine and . . . tulips. With that in mind, he moved to Virginia and met Keriann. The two soon decided they didn’t want to be roommates; they wanted to date. As part of their courtship, Jeroen took her to Holland — ostensibly to meet his family. Keriann suspects he also wanted her to fall in love with the tulips. Within a year they were married. Perhaps most importantly, Jeroen is beginning to think he’s found an ideal location for growing tulips. At first this seems odd because the most prolific tulip-growing regions have climates very unlike Rhode Island. New England is known for its hot summers and cold winters as opposed to the cool rainy weather prevalent in Holland and the Pacific Northwest. Rhode Island’s conditions are very similar to those of Central Asia, however, where tulips were originally grown. Jeroen believes tulip growing centered in the Northwest because it was a climate familiar to Dutch growers as opposed to being optimal for the tulips. In Holland, tulips are annuals. 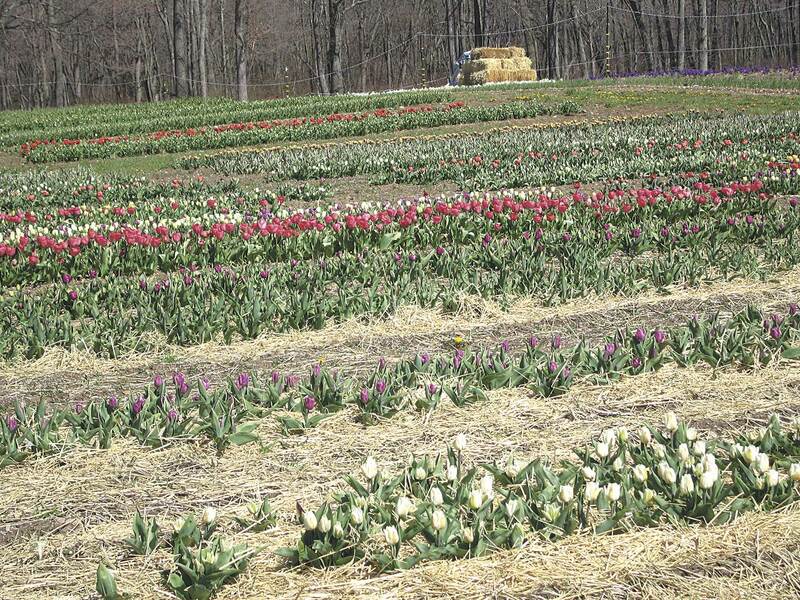 Growers dig the bulbs each summer after blooming to prevent them from rotting in the field. The bulbs are stored in a warm room and monitored under a microscope until the flower has completely developed (called “Stage G”). The bulbs then require an intermediate temperature of around 63° F for two to three weeks before being cooled to around 48° F for three to four months. What the entrepreneurial Dutch do with storage facilities happens naturally in much of New England, which explains why tulips perennialize so well here. Hot, dry summers, cold winters and well-drained soils are optimal for growing tulips. To test their theory, the Koemans plan to experiment with over-summering a portion of their seed bulbs this year and also intend to begin breeding their tulips for perennial characteristics. Just as the union of Dutch know-how and New England real estate may prove fortuitous, the interactions between Keriann and Jeroen’s diverse backgrounds have already yielded many benefits. Jeroen’s family grew conventional tulips. Keriann, on the other hand, was passionate about organics. At first it was hard for Jeroen to believe it was possible to grow high quality organic tulips . . . and quality has always been an industry-recognized trait of the Koeman family. Once Jeroen accepted the feasibility of growing organic bulbs, it was only a matter of time until he embraced a philosophy that included organics. Now he is passionate about educating everyone — growers and consumers alike — about techniques that preserve and enhance soil health, minimize pesticide use, and contribute to the general well being of the environment and all who live in it. Jeroen and Keriann have been so effective in spreading their message that even Jeroen’s family in Holland has begun to change their practices. The transition from conventional to organic bulb production is not without challenges. For one thing, the current supply of organic tulip seed bulbs is very limited. Current regulations state that organic growers can use conventionally produced seed stock if no organic source exists. Keriann initially balked at using conventional seed. Her commitment to the organic philosophy impressed Jeroen. “Keriann taught me some ethical values,” he comments. Eventually, however, Keriann came to see that using the conventional seed bulbs was an important move for the organic industry. Developing new tulip varieties is a long process, often upwards of 20 years. Tulips are mostly bred the old-fashioned way by pollinating individual plants with the same desirable characteristics. This reproduction results in some offspring that show the desired traits and some that don’t, as opposed to other processes that produce clones of the parent. It takes seven years to create a new variety that will stay true and strong using this process. Even then, there are only a handful of consistent bulbs. It takes another two decades to breed enough to market. For Keriann, the length of this process convinced her that using conventional seed “brings the best positive change in the industry.” Growers like the Koemans can take exciting new tulip bulbs from conventional growers, raise them in an organic system, produce bulbs that are truly organic, and increase the variety and availability of organic bulbs. This does not mean they have compromised their principles, though. The Koemans hope that in three years their Rhode Island farm will be 100 percent self-sustaining, meaning they will grow and sell all their own organic bulbs (aside from new varieties that will become available). Last fall they planted 250,000 tulip bulbs by hand over the course of several weeks. Their equipment, a tractor, a planter and a digger used by Jeroen’s father, were all shipped in from Holland. Keriann noted that it cost less to ship them than it would have to purchase the same equipment in the States. With the help of that equipment, the Koemans are becoming the talk of the state. 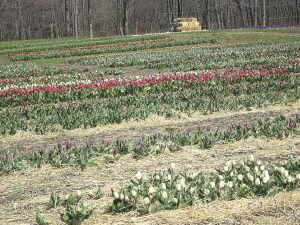 Locals are fascinated by the idea of a three-week U-Pick season at Wicked Tulips. For a modest fee, visitors can wander amongst the blooming tulips. It is an experience for all the senses. And surprisingly, most people come for the experience over and above the actual flowers. Even at the price of a mere $1/stem, only 30 percent of the flowers get picked. The bulbs are not wasted, however, as they are marketed on-line under the aegis EcoTulips which also carries daffodils, crocuses, hyacinths, and other bulbs. Visit Wicked Tulips online at www.wickedtulips.com .